There is certainly something to be said about this synth, especially if you are into music production or sound design. It could be easily priced at 1200$. For less than 600$, you are getting serious weapon into your arsenal. With powerful software editor you can easily visual edit all parameters. 300 onboard patches you can play and perform right out of the box. Used by many famous musicians and music producers including Kanye West or for example Grammy Award Wining Producer Teddy Riley. 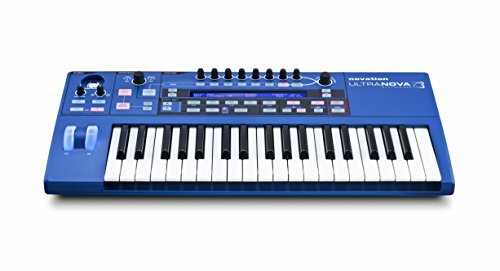 What Novation UltraNova does the best is the creating new huge sounds: with 14 conventional waveforms and 36 wavetables you are getting 5 effects slots for each sound. Impressive. It also come with 12 band vocoder with dynamic mic. You can plug into Novation Ultrasound pretty much anything and tweak this sounds as you want. 2 inputs, 4 separate outputs, SPIDIF output, and also MIDI in/out. Well done. More in following video.